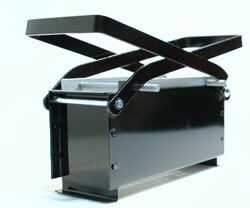 Pictured above is a paper log briquette maker together with a paper log briquette. If you enjoy reading newspapers and you have a multi-fuel stove or open fireplace, a paper log maker offers a great way to recycle, reduce your carbon footprint, and heat your home for free. There are a few different designs of paper log briquette makers out there, but they all work in pretty much the same way. Soak waste paper (shredded newspaper and other papers, cardboard) and/or wood chippings / sawdust in water over night. The soggy pulp created can then be put into the log maker and the handles squeezed to remove all of the moisture. Leave the paper briquette to dry out fully (for a week or two), and then throw it in the fireplace. Well compressed paper log briquettes will burn well for a couple of hours and leave behind very little ash. They can also be lit easily without the need for chemical fire-lighters. 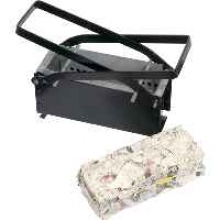 Pictured above is a Briquette Maker which is priced at around £15-20. Pictured above is a (no soaking required) logmaker made from recycled plastic which is priced at around £20. This will make small logs which will burn for up to 1 hour. Here is the instruction manual (PDF download) for this logmaker product. A wide range of paper log makers are available for sale. Click here to buy Paper Log Briquette Makers.